Are you wondering how to clean a cast iron grill? One of the best reasons to purchase a grill made from cast iron is the fact that the tough metal is so durable. However, as with any type of grill, regular cleaning and proper maintenance is essential if you want to keep your outdoor cooking device looking good and functioning properly. Unlike stainless grills that can easily become scratched and discolored if you use any type of abrasive cleaning product or surface on them, cast iron grills are very tough and resilient. Rather than trying to prevent scratches, the big challenge with taking care of a grill made from cast iron lies with preventing rust. When you purchase a new cast iron grill, be sure to follow the manufacturer's instructions for how to season the item. As with cast iron pots and pans, the first step in keeping your cast iron grill from developing rust is to season it properly before using it. If you purchased your grill used, you will be able to tell if it was properly cared for by the previous owner simply by looking at its condition. If there is significant rust build up on the grill, it's likely that it was not seasoned before being used initially or not did not receive proper care on a regular basis. 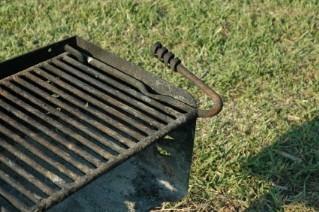 However, it's not impossible to restore a rusty cast iron grill to proper working condition. As long as the rust has not been allowed to build up to the point that it has eaten through the iron, you can probably remove it and extend the useful life of the grill. You can remove rust from cast iron in several different ways. It's best to start with some type of abrasive cleaning tool when you are trying to get rust off any type of metal. Wire brushes and steel wool are good choices for cast iron. You can attack the rust build up with just an abrasive surface and your own muscle power or you can opt to utilize a cleaning solution to aid in your grill cleaning efforts. Vinegar - Rub the rusty surface with plain white vinegar at full strength and allow it to sit for a few minutes. Once the vinegar starts to dissolve the rust, use your wire brush or steel wool to begin cleaning the affected area. Repeat until the rust is gone. Baking Soda Paste - As an alternative to using vinegar, you can attempt to clean rust off cast iron grills and other metal surfaces using a thick paste make from baking soda and water. Apply the paste to the rust build-up and allow it to sit for a few hours. Then, scrub away the paste using an abrasive surface, repeating as necessary. Salt Paste - If you need something more abrasive than baking soda or vinegar to remove the rust from your cast iron grill, make a thick paste of kosher salt and water. Apply it to the rusty area, then use steel wool or a wire brush to scrub away the rust. Repeat as necessary. For particularly stubborn rust, you may need to begin your cleaning efforts with a salt paste, but may find that you can switch to the less abrasive baking soda paste once the first few layers of rust have been removed. It's very important to clean and season the grates of your cast iron grill after each use. While the grill grates are still warm but after the fire is completely out, wipe them clean with a paper towels or a dish towel. If there are particles of food stuck on the grates, use a wire brush or a nylon sponge to scrub them away; then wipe the grill grates again to ensure they are clean and free from food build up.If the cooked on food is too stubborn to come off easily when you scrub the grates, create a cleaning paste by mixing kosher salt or baking soda with water. Apply the paste with a nylon sponge and scrub the area until it is free from stubborn build up. Once you have removed the rust from your cast iron grill, take the time to season it by rubbing it down with a thin layer of vegetable oil. It's also important to keep your grill grates seasoned, coating them with oil after each cleaning. Repeat the seasoning process periodically to prevent rust build up from building up. Follow these tips for how to clean a cast iron grill and maintain it and you can expect many years of service from this inexpensive outdoor cooking tool.